3 — Developing a method to co-design self-built homes. Posts relating to the development of a story board for your proposition. Posts relating to the presentation of the user journey. This week, we started to polish our prototype ideas and which softwares will we use to accomplish our prototype design. We decided to use Balsamiq, Invision, Photoshop, InDesign, Sketchapp and Powerpoint. We have interpreted an interactive prototype as something visual where the people themselves can follow the storyboard that we will present, compared to as if they would play a video or computer game. For our prototype, we decided to do a scene presentation explaining how would it work from the drivers or pedestrians vision. We intend to create the signs design and to explain how would the entire process work. 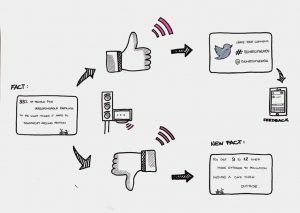 As we have explained on the previous logs, the prototype is a informative digital sign with a sensor, which the participant after reading a fact would respond with a thumbs up or down to then get a Twitter handle or another fact. On our presentation we hope to be able to show exactly what would be presented to the passers-by, and what their next move would be. Our group is currently refining the final ideas and trying to get to a final key concept to present in the end of this module. We have divided the work by taking different roles, that is, maker, stitcher, writer, collector and interviewer. Although, we decided that the group will work together and be apart of any role, in order for everybody to be on the same page during the whole process. But we do keep in mind that some of us are more skilled in some of the roles, for instance Gabriela has created the latest visuals for the final presentation, while the others have been collecting information and researching facts about the benefits with cycling as a transportation mode. We have not yet decided who is going to be the interviewer during the final presentation, as well as who to invite for it (but we intend to make Ali, Mark and Julie part of this). Next step is to continue further with the research about the sensors and how they would work for our interactive signs. We will also continue to read on the different example projects (Australia for Vote etc.) in order to be able to back up our project as well as possible during the final presentation. 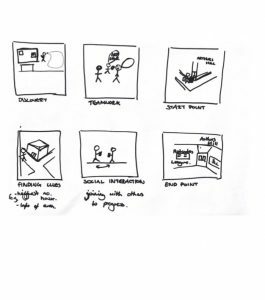 These pictures below show the creative process of some of the visuals that we are planning to use for when presenting the final prototype. These were made on Balsamiq and Photoshop. The visual part of our presentation will be composed by, besides an introduction of the project and example research, introductory scenes that shows the storyboard from different perspectives, for example Heaton Road looking from the “outside” and from a “car view”, signs, thumbs up and thumbs down, responses and a phone with the twitter hashtag #thumbsupheaton. For the prototype completion we would need more pictures, and the final designs of the facts signs and the Twitter handle sign, in order to include the whole story board that we have created earlier. Combining the new examples and the further research with the prototype designs we believe the we would be able to start with the final presentation. For our user testing plan we aim to find out both the successes and failures of our design from the key stakeholders in our project. We want to invite Katrina, Nigel and also potentially some youths living in the area whom Katrina may have some connections to, to also invite, as our design is focused around giving the youth an opportunity to explore their area and create a link between them and 250 Philip Street. Our test will be conducted in the Wingrove area as this is the base context for our design intervention therefore we would be able to receive genuine feedback of how well the explorer/game works within the setting. We will need a smartphone for the interface and we thought about including paper charts with factors which we would ask users to rank from high to low, in terms of the games; ease of use, engagement, how well it responds to the brief, the longevity of the game and the overall enjoyment and fun element. How would you use the navigation tool? Encouraging them to think aloud and ask why they did a certain thing. We want to achieve “rich verbalisations…by employing relaxed thinking aloud” with the aims of gaining a more insightful response to usability problems and successes (Herzum 2016). Before testing the prototype however, we want to gain insight into the users’ knowledge of the area now, if they know about events and get involved in them and also their current digital abilities, as some may have little experience with a digital interface. This is one reason why we wanted a simple prototype with obvious navigation features. Running briefly through the testing, the participants will engage in the navigation feature and explore their area, completing tasks and activities. We want them to explore the routes and experience the active side to the game. We would also want them to interact with the background features of the calendar, chat, picture albums etc. to determine the success/failures of these as well. In terms of measures of a ‘good’ design, we want to capture the users view on the ease of use, the durability of the game, and ratings of the ‘fun factor’ etc. We will document all these through media images, basic charts and stickers, and written statements from users. We want to ensure the design is a good idea and if it would actually help the community to improve the social connections within the area. The design we are proposing is a unique social explorer into the Wingrove community. At the beginning of our task, the digital scene was scattered with unused Facebook pages, Watsapp group chats and website events. We are aiming to combine all these features and create one interface in which Wingrove residents can check events, interact with one another with regards to these events, with a focusing on the youth as our target users as during our user research many mentioned the need for a youth program in the area. This explorer could be the start of the beginning to bringing the youth into community events, with use of 250 Philip Street, a building which was once a youth club itself. We want users, particularly the youth, to progress this narrative and allow them to engage with their area through active exploration. Hertzum, M. (2016). A usability test is not an interview. Interactions, 23(2), 82– 84. This week we looked at user testing in order to provide a successful app. 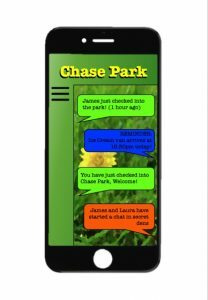 It is important that we get feed-back in order to improve the app for Chase Park users before we submit our final design. When planning what testing would entail, we think it would be useful to get Alan and Ken from Friends of Chase Park, Claire from Gateshead Council and a number of children from Front Street Primary School to trial our prototype which would be in the form of a power point. A way of carrying out the testing would be by conducting a 5- Act Interview. Firstly, a friendly welcome. 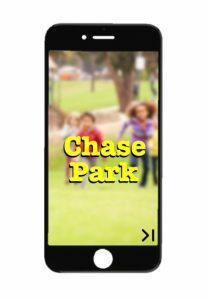 Secondly, context questions- asking whether they use Chase Park, how often they go, if an app would be relevant to them etc… Thirdly, introduce the prototype, explain what it is. Fourthly, task – get them to carry out tasks on the app e.g. can you tell us an event or find and create your secret group. Fifth, quick debrief, get their feed-back about the app. When using the app and carrying out the tasks stated above we would get them to think out loud in order to understand the process through new eyes. When it comes to carrying out the user testing it will involve myself, Laura and James. Louis was heavily involved with creating and providing the prototype so as a group we feel it best that he isn’t involved in the interview/testing process. In order to make the app realistic for our testers we are going to be using power-point which will show the images of the app. Hyperlinks will be in place to allow movement between the app pages. Interactive prototypes aim to show how the interaction will work in practice. This is a much better way to evaluate design. Commercial prototyping software allows you to define clickable areas, transitions and events, in order to produce an interactive prototype that captures the user flow process and demonstrates interactivity, without having to write a single line of code. Basic programs such as PowerPoint and Keynote can be used to create such prototypes. You can use interactive prototypes in user tests before any code has been written. The whole point of having an interactive prototype, and prototypes in general is to ensure that the proposed design will work effectively in practice before spending money, time and effort developing code. This week we began to work on our prototypes for our Wingrove Community explorer application. The prototyping tools we have decided to use for this project are in a 2D digital format through the use of Microsoft PowerPoint. Our application has two primary uses for its user. The first is to easily and effectively communicate with other residents, which is achieved through the use of a contacts search bar whereby the user can message other people to organize community events and gatherings. It works the same way as your contacts on your phone. The application also includes a calendar to pin community events that are of interest to the user, which is followed by a map which shows the locations of various events organized by the Wingrove Community in the local area. In practice, the map will be interactive giving the user the ability to tap and select locations on the map that they wish to explore. Once a location has been selected the user will see a picture of the location on their screen, and from there, they will have the option to select and search for activities within that vicinity or building. This is where our idea then overlaps with the creation of an interactive form of leisure for the local community. We have done this by implementing an activity section whereby the user can take part by completing tasks designated to various locations e.g. taking a picture of a community landmark within a certain area to prove that it’s been visited, or carrying out some kind of community activity and evidencing it with a picture. Though this feature was designed with primary and secondary schoolchildren in mind, anyone can use it. The whole purpose of our application is to provide community information on the go in a compact and simplistic format, whilst giving the user ways of interacting with and contributing to the local area, or simply keeping in the loop with other residents in the area. In terms of what still needs to be done to complete the prototype, we just need to add some finishing touches that explain and display all the features we intend to include within the application, such as the treasure hunt game. Our idea is basically a social media app for the local community to increase the participation and awareness of local residents. This week we looked at prototyping and made a start on creating our own interactive prototype. 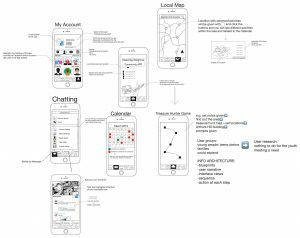 An interactive prototype is something which is ‘real’ for the user to look at and use. For example, they would be able to navigate around an app clicking on buttons which then moved to a different page etc. so that it feels the functions are real. We have decided to use PowerPoint for our prototype of our app. PowerPoint is a simple tool for creating a prototype, but it is a tool which we are most familiar with and think it will be able to perform all the necessary functions that we need on our app. We will show our prototype by getting people to go through the prototype app on the PowerPoint by simply beginning the slide show and then the user can click on the buttons, such as a ‘main menu’ button or a ‘home button’ to go back to the main menu, these will be linked with a hyperlink which will make it interactive and give it a feeling of ‘realness’ because things will happen depending on which icon or button you select. We still need to complete a few more interfaces of different pages to the app before it is complete, but below are a few pictures of what our current prototype looks like. This one is the extra post of SIA’s storyboard blog and this is Zhaodong. 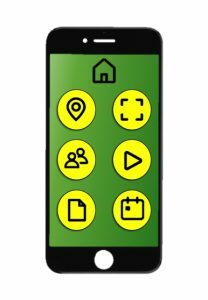 This is the storyboard of the Greening Wingrove Community App and it is a little bit late to post it to the blog because of my personal issues so very sorry about that. Basically the idea of the App is to provide a stronger connection between the community and one of our previous ideas was to make a treasure hunter game within the community and now we put the idea into the App which let it become a part of the App. Apart from the front page the App has four basic functions: Chatting, Calendar/Activities, Local Map and ‘My Account’. On the front page you can see the local temperature and weather today as well as the news and announcements within the community. The treasure hunter game is set as the latest news here and can be clicked for mor info. and we made some analysis on it (you can open the picture attached and have a look). The chatting function is similar to the iMessage but apart them a new function is designed called ‘Moments’. You can share your own special events happen around you here and let your friends to look and make comments. Calendar/Activities function looks like the calendar on your phone but also shows the activities that will take place as well as the activities that you will attend and show you the location of the activities. For the Local Map function, the location with schemed activities will be marked and able to be clicked and you can see different activities within the area and these are related to the Calendar/Activities function. ‘My Account’ is very easy to understand: manage your personal account, make self-introduction to others, add more friends and precious pictures into your album. More infomation of the App can be seen in the picture attached within this post. Leading on from last weeks extended storyboarding/sketching session, this seminar we worked on improving our location-based game idea and expanding the interface to include a map of Wingrove in which users could click on certain ‘hot spots’ and find activities or local information. We wanted to broaden the initial GPS game into something more tangible in which implementations to the local context could be made. We began brainstorming some ideas for what could be included in the digital game/interface as we did not want to overcompensate and flood the interface with options. We narrowed in to focus on exploration activities and interactive digital inclusions such as camera options that would prompt digital probes in order to gain wider opinions on the local area and Greening Wingrove activities. 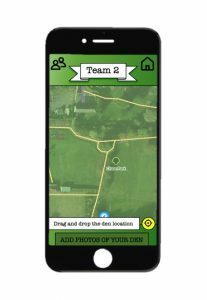 We wanted to preserve the idea of having a treasure hunt feature, furthering this to think about engaging with the idea of including schools or families, to tackle the safe-guarding/ethical implications a location-based game may have. For our initial plan, we thought about having a map as the home screen and placing pointers which the user could click on to participate in different activity options. Such as history tours or nature walks. 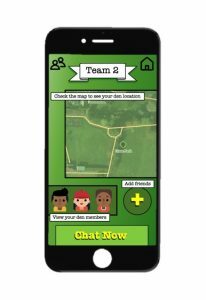 Including options such as these it begins to broaden the location-based games into potentially becoming part of both youthful and family livelihoods, as it could be something that families want to use together to explore their area and get outside. This gives users a broadened scope of activities they could engage with whilst using the service as, although we are mainly focusing on a younger target market, the wider aim of social cohesion can only be met with a developed broadened user base. Our new refined storyboard will be uploaded in a separate blog post as we wanted to ensure it portrayed our ideas seamlessly. Our idea of location and mapping is key in driving our aim of social cohesion, nationwide there is a lack of children playing outside, we feel that by having this game/app which enforces people to go outside and explore, with the win-win potential of gaining free or discounted activity incentives, it is responding to and tackling this urban issue on a local level. Organisations such as Playing Out address this, by attempting to ‘activate street play in neighbourhoods’. In response to the digital interface’s unique aspects, the app is a personalised social media space for the residents of Wingrove, from our user research we found out that the Facebook pages are scattered and become very inactive shortly after starting up. Bringing all these pages together into one system would refine the area’s digital platform voice and provide a space for local events to be promoted and spoken about. Moving forward, we would still like to begin to prototype the locational game based idea, focusing on the youth of the area as that group was at the forefront from the opinions of the participants of our user research. 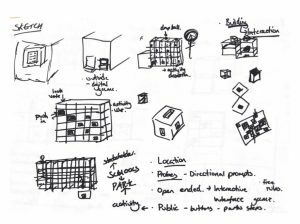 Our demo activity for the prototype may simply be a piece of paper with instructions, questions and locations on and then using google maps to travel around the map to complete the treasure hunt quest, or using development software to create and interactive prototype. In terms of promoting and gaining further user research from our prototype, a youth workshop would have to take place, perhaps linking in with the primary schools or the Nuns Moor centre. Our next steps are, to further develop and refine the technicalities of: 1) user narrative, 2) the information architecture and data of the interface and 3) initial design views of the interface. We want the product to be focused on the map idea, therefore having the design be centred around the map of Wingrove. This week, we began to prototype our design. From our storyboard we decided to visualize the interactive screens. The plan is to place them on traffic lights so that both pedestrians and car-users will be able to get involved with this project. Our prototype illustrates how a participant approaches one of a number of signs, that will be placed along Heaton Road. As mentioned in last week’s log the signs will display facts or tweets advocating cycling as a mode of transportation. The participant would then make a thumbs up or down, depending whether the participant likes the text that is being shown on the sign or not. Sensors on the sign would then register the thumbs up or down through Infrared & Motion Sensors and then, depending on whether the participant responses with a thumbs up or down, will lead to the #thumbsupheaton hashtag or a different cycle fact. This week we also looked further into research relating to our project. We wanted to find some examples that we could directly get information from. We looked into the Australian vote with your feet project, which helped us to think more about the type of interaction with the public we will have. We have found many different projects that use the same type of sensory technology although not as many that focus on the thumbs approach. This example uses hand gestures to control electronic devices, we partially can take inspiration from this as we need to the hand gestures to be able to read and control our signposts. Inspiration from previously created websites e.g. After visiting the primary school we gained a bit more of an insight of what features we would like to include within our app. Sketching out ideas of what features the app would have and what they would entail, we decided to focus on one specific feature of our app that seemed to be a strong point when visiting the school. 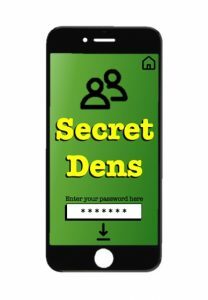 Secret dens were talked about a lot and we think this feature would make our app unique and feel we have a lot to work with. 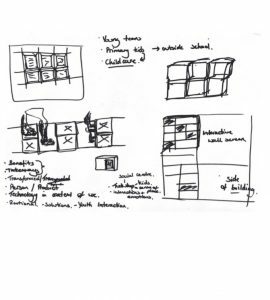 Sketching out further detail and features of this one specific topic, sketching the app as a walk through and how the children would use it. This week we began storyboarding our idea with the aid of Erkki Hedenborg, our academic mentor. We discussed many alternative options and finally honed our digital idea into a designed interactive game for social cohesion and community exploration. 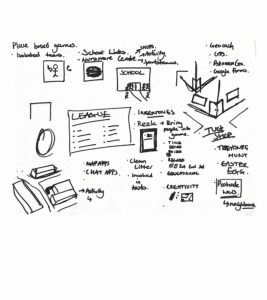 During the beginning of the session we began drafting potential ideas for a digital solution, initial ideas started as digital interventions placed around Wingrove in specific points that would advertise activities and allow users to interact with it, by sound or movement for instance. We then moved on to discuss this interaction in a more physical manner by creating an interactive game. With this, users would gain insight into the Wingrove area, meet other locals, and gaining knowledge of potential activities happening. This is important as those we questioned in our door-to-door survey did note that they did not know of many activities taking place within the area. The idea stems from the concept of location based GPS games such as Pokemon Go, Geocaching, and ActionBound, in which users have to explore an area to earn rewards or learn things about the specific area chosen. We wanted to replicate this idea by giving young adults/teenagers/kids the option to discover Wingrove and connect with other users to enhance their social connections within the area. Potential ideas for prototyping this concept could initially be a piece of paper with set questions or facts on it and use of google maps to navigate the treasure hunt. Those using the game would have a set route to follow and have to pick up points along the way that would collate into a final league board, with those with the most points earning prizes or gift vouchers (potentially). Some reservations are held by having incentives to play the game, however we did then lead onto looking at having proactive rewards such as a free one hour music session, or one free activity session at the Nuns Moor centre. In doing this, this improves the users awareness of activities within the area, therefore subverting their attention indirectly to other recreational activities for the youth to engage with within Wingrove. Below are some initial mind-mapping/sketching that led us to the interactive game idea. From this we took insight from our user research, as many of the people we interviewed discussed the need for more youth programmes and activities, by using the game idea it gives teenagers and kids the opportunity to play outside and embrace their area rather than having nothing to do. In addition, the use of the Arthurs Hill building as a central addition to the game to engage the youth of the area with the activities going on there, thus indirectly creating a youth centre/central point by having them physically visit the building. Katrina and David Webb both spoke about the need for youth engagement within the area, we feel targeting this group will then set the path for future generations to converse with one another and begin a narrative with them in Arthurs Hill and community engagement. 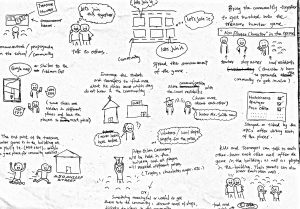 After including our user research we developed a final storyboard proposal which depicts the narrative of downloading the game to the end point of the game. Our next steps include refining the game idea, deciding where the set routes would be, as well as potentially including different interfaces for alternative uses. The game idea does hold some reservations as we do need to define what exactly the user is putting in and getting out of the game, what sets this idea apart that would make users want to actively engage with it and also, perhaps developing what else the interface can offer, so that we define exactly how it meets our project aims.